Last week I was asked to help judge a WebRTC hackathon run by Acision, for apps based on its Forge cloud platform. (It was called Forgeathon, and run by a company called BeMyApp. Apparently, I am now a "Celebrity Guest Judge", which I shall be adding to my business cards and LinkedIn profile in due course). It was won by an app called "Yoroshiku" which was a fun concept of Tinder-style "swiping", but to find language-exchange partners rather than dates, find out if they're online, message them, and then set up a video-call inside the app, speaking Japanese or Welsh or Klingon to each other as appropriate. It is a great example of contextual communications - voice/video which is both inside a given context (app/website) and which is given extra function and meaning by that context (eg language-matching). Yoroshiku is precisely the sort of use-case that WebRTC is designed for - and the fact here it's bundled into an iOS app, rather than a browser, also points to the role of cloud-based APIs and the growing importance of mobile use-cases. I also liked the 2nd-placed entry Codemate which was aimed at collaborative coding between developers, and the 3rd-place one, Trippr, about recommending travel destinations. All interesting examples of what's possible - and written in 6 weeks by individuals or small teams. I'll be writing a lot more about contextual communications in coming posts, but there's an important caveat about its evolution: most developers spending their lives in a given "context"- language tuition, human resources, travel agency, games, photography, real-estate or whatever - don't know much about communications. Especially if they're solo app developers, they will never have heard of SIP, video codecs, NAT-traversal, latency/jitter, echo cancellation or any of those other things that comms people talk about every day. Not only that, but many of them haven't even thought of the possibilities of using contextual communications, just as many haven't thought about other new APIs or technologies. If you're developing something for language students - or lawyers or oilfield engineers - you don't necessarily have a checklist of "cool stuff that might help" - whether that's realtime voice/video, or other HTML5 APIs for 3D Graphics or whatever (did you know there was a W3C Vibration API? No, me neither). Then there's a ton of non-web stuff clamouring for attention wearables, drones, 3D printing and so on. Basically, there's a never-ending list of cool stuff (and APIs) for developers to exploit to add coolness and functionality to their apps and websites. So WebRTC has to cut through all the other worthy possible additions and get to the top of the developers' priority list of things to implement. The simplest cases will be those where they already know they want to add realtime comms, and they go looking for the best/easiest way to do it. But in others, it's an "unknown unknown" - they don't even recognise the possibilities from using voice or video, and haven't heard of WebRTC - it's not even on their radar. This is where evangelism comes in. I'm seeing a steady increase in outreach by the WebRTC industry to new constituencies - especially general web and app developers, and those focused on particular industry sectors. Hackathons are good examples, as are the various Meetups (including the one in Barcelona next week), and presentations at general web conferences and vertical-industry events. But more is needed, to raise awareness and understanding. The problem is that most such developers won't be buying WebRTC infrastructure - gateways, SBCs and the like. They will mostly be using open-source components, or cloud PaaS offers like Forge (or Tokbox, Kandy, Respoke, Twilio, Temasys, SightCall, AT&T, appear.in and a long list of others). And those players - apart from an obvious few - don't have much marketing clout. There are many more WebRTC marketing dollars aimed at people "adding web to their existing comms" than there are for those "adding comms to their existing web". There's also a wariness among some vendors about over-promoting the PaaS platform concept, as it may reduce their addressable market for direct sales to individual customers - not least because some of those providers "roll their own" components rather than use off-the-shelf gateways or SBCs or media-servers. What I'd like to see - as well as more direct initiatives like Acision's here - is the formation of some sort of coordinated WebRTC Forum body, which exists to promote the technology to a wider audience of developers, rather than define standards internally. Such a forum could host demos & showcases, run competitions, write white papers, field speakers or workshops at events, align web resources (maybe even based on WebRTC...) and so on. There's plenty of these types of things for other bits of the Internet and communication industry, but nothing specific to WebRTC. (One exception may be Google's own efforts on its G+ forum, run by the Chrome team). I'll be at the Barcelona Meetup next week, and also Enterprise Connect in Orlando. I'd be keen to have some discussions about how a WebRTC Forum might get started, funded, sign up members and so on. I'm probably not the right person to coordinate at, but I'm happy to help work to bring together interested parties. In the meantime, I'll be keeping an eye on other WebRTC hackathons and events, and see if any examples of best practice jump out, as well as interesting case-studies and usage ideas. And if you're looking for a judge, advisor, analyst or event facilitator, please get in touch. Ideally, not in Hungarian, as I swiped left on that. I'm a big believer in 4G. Not just because I can do certain *tasks* faster, but because it just *feels* fast. Some of that perception is from quicker connection and start-up times than 3G, some is from impressive headline numbers when I've run a speed-test, but a lot is from a sense of "potential", knowing it's there if I need it. It transpires that something similar is true of fibre in the fixed world - especially in FTTP (fibre to the premise) guise, according from some proper consumer research done by friends at Diffraction Analysis. People like raw speed, are annoyed when they can't get it, and are prepared to upgrade further once they do. They might even use it to consume extra operator-enabled services as well. One of the regular Twitter debates I have with colleague Martin Geddes is whether broadband "performance" is about specific, measurable, application outcomes or not ("QoS" to most of us). He links that to an argument for non-neutrality, as he contends that specific Internet application providers have different performance requirements and should be allowed to "trade" for them, given the limits of the network. Conversely, I argue that a lot of the benefit and value from fast, open (and neutral) networks is not application-specific, but rather is intangible. It's the potential for both users and developers to do what they want today or in the future, without trading or risking potential competitive abuse or extra friction added by ISPs. It's like having a powerful car but sticking (mostly) to the speed limit - you know the "shove" is there if you need it. That extra acceleration on the highway on-ramp doesn't get you to the destination faster - but it feels good. Some even pay a premium for unreliable or twitchy supercars, despite the chance of a bad (even catastrophic) "outcome". We're human. Perceived performance - and flexibility - is often more important than measured performance. Doesn't matter if it's broadband, cars, fashion, headline megapixels in a camera or a million other areas of life. There is almost always some correlation between "More of X" and "Better outcomes", but even if it's not a perfect correlation, we don't care. Purists myopically focused on "optimisation" often don't understand this, or other human emotions like agency/control, a sense of novelty, image and so forth. While these apply more to individuals than businesses, there other factors like privacy and security and agility too. In other words, "just give us faster networks & then get out of the way. Occasional glitches are a price well-worth paying for freedom and permissionless connectivity". And that's the thing - the vagaries of mobile networks (coverage, congestion and so on) have taught application and content providers to work around performance limitations and occasional failures. To expect them and plan for them - so they use cacheing, variable bitrates, UI interventions to warn users of problems, clever codecs and error-correction. There will always be a weakest link. It's not perfect, but it beats having the hassle, friction and perhaps commercial conflicts-of-interest involved in paid QoS. It's why "non-neutral" mobile business models won't succeed, even if the law allows. But back to fibre and FTTx, and some hard data. I don't often reference other analysts and consultants. (Martin G is one that I collaborate on about voice/comms, and disagree with on networks). But when it comes to the fixed-broadband world and especially fibre networks, access business models and wholesale metro, I'll gladly defer to Benoit Felten, who's been covering that beat for years. He now runs his own research firm, Diffraction Analysis, originally out of France although he's now living in China. Many telcos have been slow at rolling out fibre, often because they have been unconvinced that consumers really want it, would pay more for it, or might adopt additional services as well. Diffraction has been doing some interesting work in collaboration with the FTTH Council Europe, looking at the real-world experience of consumers who have fibre broadband, and comparing it to ADSL. Benoit has now published research on Sweden (one of the most developed FTTx markets in Europe), and has been working on France and Portugal studies as well. Fibre is perceived to be higher-quality than DSL, even by people who don't have it. 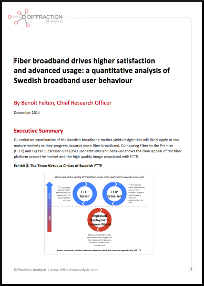 FTTP users are more "satisfied". And higher speed FTTP equates to even more satisfaction. It's not about individual "outcomes" specifically. Fibre improves satisfaction with various "speed" metrics - latency, upload, download, variability and so on. 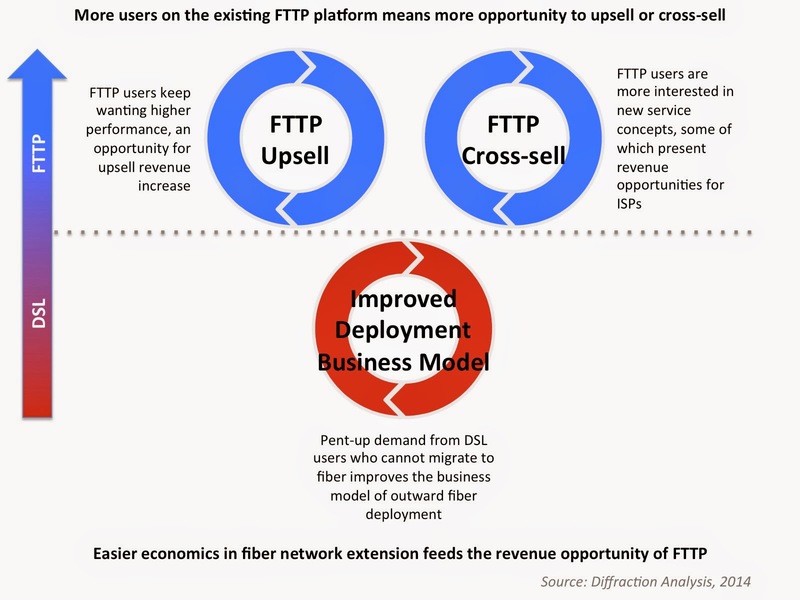 Individual users are happier with FTTx when asked to compare with their past DSL experiences. Most DSL users perceive fibre to better (presumably because of friends who have it, or media coverage). Upgrades, both DSL-to-FTTP and FTTP-to-faster-FTTP are typically linked to wanting more "performance", ie speed. Lots of DSL users won't be upgrading soon, either because they can't get FTTP where they live, or because it's perceived as too expensive. FTTP correlates with higher use of triple- and quad-play, although it's not 100% clear which is cause & which is effect here. FTTP users do more stuff like streaming, video-calling, VoIP, tele-education etc. FTTP users seem interested in advanced services (perhaps with operator involvement) like telemedicine, digital home services, TV videoconferencing etc. People like fast Internet access, for its own sake. Speed sells, and feels good irrespective of specific applications or outcomes. People who like fast Internet also seem more interested in possible non-Internet network services too. To me, this suggests that not only is there a business-case for investment in faster networks (FTTX, 5G etc) but that we need to consider both measured and perceived performance. Tangible and intangible. This is something missed by most of the economic-led studies on broadband - and certainly by all those debating the FCC's Title II Net Neutrality plans this week. The links are to Diffraction Analysis' billing (although my company Disruptive Analysis has a financial interest here). You should get the report emailed through within 24hrs (NB the time difference given Benoit's location in China). The myth of "Telcos winning back revenue from OTT players"
"How Telcos can Win Back Revenue From OTT Providers"
These are almost all uniformly wrong or at least, misleading marketing hype or clickbait. Let's parse that sentence "win back revenue from OTT providers". I'll tackle the continued use of "OTT" later in the post - but it's a legacy term that has no place in the telecom industry going forward. But first, whatever you name them, so-called OTT providers generally do not take revenue from telcos. They take customers or usage, by offering either cheap/free or better services - often both. People use Whatsapp or SnapChat as a free, more-functional and cooler upgrade to SMS. They use Skype as an improved user-experience to telephony, and we're seeing switching to myriad new voice/video apps and WebRTC-powered services (my report here), for contextual comms. Internet app providers often derive value in other ways (ecosystem, advertisers, stickers, recording, cloud services etc) by giving away message or voice transport for free. There is no - or very little - revenue to "win back". Telephony and SMS are not going to disappear entirely, but they are old and clunky lowest-common denominator services in a world of unlimited choice, and best-of-breed applications targeting individual use-cases and preferences. "Winning back revenue" requires there to be revenue to win, and renewed consumer appeal competing against alternatives to a sufficient degree somehow to encourage payment. Person-to-person SMS has historically been a rip-off. It's never been "value-based pricing", it's been grudge- or resentment-based pricing. We used to hear people say it allowed $10000/MB - and that's the problem. It was orders of magnitude too expensive for a service that never evolved over a 20-year period. Sending 160 characters from A to B was cool in 1995. It's not rocket science in 2015. Similarly, telephony transport is priced expensively compared to costs and value (for most uses) too. That said, VoLTE puts the implementation & production costs back up, in the unproven hope of future gains from spectrum re-farming. The telecom industry used to make over $100bn a year from SMS. It still makes a decent fraction of that, although the exact amount depends much on accounting and bundle-allocation chicanery. Excess SMS profits of close to a $trillion over the last decade or two seem probable - with minimal service innovation from reinvested cashflow. To put that in context, it's probably larger than all banking bonuses worldwide over the same period. That $100bn+ revenue is not coming back from simply sending mobile messages. It might partly come back from adding value to other ecosystems, or enabling particular purposes through A2P messaging integrated into business processes, but in terms of straightforward A-to-B transmission of text or pictures, it's gone. An SMS is not much more valuable, inherently, than an email, and will converge with email in terms of pricing. In any case, increasing A2P revenues is not "winning back" revenues lost from P2P. It's completely distinct, and isn't occurring at the expense of Internet-based alternatives. (Obviously, RCS just worsens the situation, by consuming extra costs & staff resources, for zero extra usage, zero extra revenue, a major opportunity-cost impact, and possible brand damage. It is worse than useless and needs the industry to capitulate entirely. I believe RCS needs to die with an obvious bang, not a whimper, for everyone to "accept & move on"). 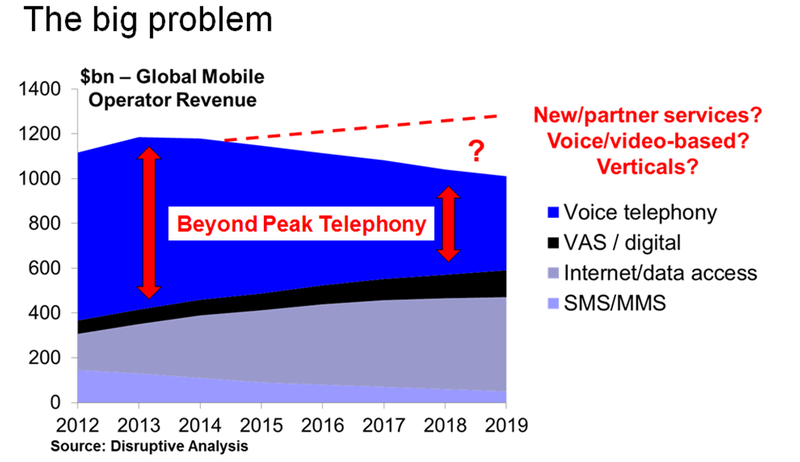 Similarly, the decline in mobile telephony revenues isn't going to be slowed much by VoLTE, and certainly not reversed. It's just telephony v1.1, and although HD voice and fast call-setup are nice, they don't provide an obvious basis for billions in new revenue. VoLTE (and WiFi calling as well) are moderate feature upgrades - they don't change the value proposition of telephony, or the use-cases to which it can be applied. They will not "win back" revenue that has shifted from "vanilla phone calls" to other modes of communication. Enterprise services are slightly more complex - but there the "OTT" services are essentially just IP-PBX or UC platforms from major vendors, or else they are 3rd-party cloud services for conferencing, contact centres and so on. Those have been in place for years, and while telco-hosted UC or SIP-trunking have important roles, few in the industry would suggest they are seriously "winning back" revenues from WebEx or Microsoft Lync. We can also forget about the silly ideas that some suggest, about arbitrarily charging/taxing the Whatsapps and Skypes of this world - as for example Dutch, Indian and Singaporean operators have tried to propose in the past, before getting intense public and regulatory push-back. Firstly, most Internet app providers and developers don't have the ability to pay 10's or 100's of billions of dollars. Secondly, unless compelled by telco-lobbied (bribed?) regulators, they have no reason to do so. They don't need interconnect, nor QoS, nor sponsored data. They simply need half-decent Internet access, to offer applications that consumers deem to be valuable. Thirdly, there are no obvious mechanisms for this - especially for peer-to-peer communications, or new formats. In many cases, interconnect doesn't make sense, as there is no feature-parity with humdrum "standard" services like SMS and telephony. There is no pot of money in saying "we're dumb, so please tax the clever people" - if telcos want to make money from selling Internet access, they need to balance it against the likelihood that users will shift some of their communications away from monopoly, legacy, unappealing services. If operators want to "regain revenue from Internet players" there is only one way to do it: innovate at a service/application level, either internally or with specialist external help, and compete. Probably, that innovation will itself require the open Internet, the web, mobile apps - or perhaps, proprietary communications platforms for certain uses. It will need a combination of both service development (for direct monetisation) and platform innovation (to attract developers). Both require a culture of risk-taking, software development, innovation management, partnership, and a willingness to "act first, standardise later, if ever". It's possible that VoLTE, or network-based telecom app & API platforms, or A2P SMS might form a role, but they still need multiple layers of genuine novel service elements that add value and differentiation. Telcos need to solve specific user or business problems. There are no new generic, standardised services that will pass muster on a standalone basis. (No, ViLTE video-calling won't make a difference). And yes, some vendor solutions might help here. Telecom application-development platforms, new billing and OSS systems, gateways and WebRTC systems (my report here) of various types, SDPs and their evolutionary descendants, virtualised NFV components that are flexible and scalable and so on. And potentially, all of these allow operators to create new services - as discussed in yesterday's post on NFV and SDN. But those will be incremental revenues - not somehow displaced from Facebook or Google, unless they specifically address the online advertising sector. The telecom & Internet business is not a zero-sum game. Revenues for plain-vanilla standalone phone calls and SMS are declining. Other things will rise, but the idea that telcos will "win back" revenues that have evaporated from services nearing obsolescence is a flawed and false narrative. Not only that, but most operators are hoping to offer API-based capabilities to Internet firms, and act as developer platforms. And a golden rule of such business models is that the platform owner has to help the developers make more money even if they then take a cut. If telcos want to make money from Facebook, WeChat, Skype, they will need to help them earn yet higher revenues. They will have to employ developer-relations or partner management staff whose job will be increasing Viber's and YouTube's and Netflix' and SnapChat's scale and value. So a more reasonable slogan might be "Telcos can win a share of OTT's future accelerated growth". They won't "win back" revenue unless they compete head-on and win. Back to the terminology: as a general guideline, anyone who uses the term "OTT" is in the wrong job, especially if talking about voice/video/messaging. It betrays an antiquated sense of "entitlement" and "network privilege"- and a lack of understanding of the Internet and software development. (People in the IPTV/online video sector tend to use OTT in a different way that is less belligerent and confrontational). All telcos have so-called "OTT" activities - none could even exist without their telco.com website on the Internet, for sales, customer service and even investor relations. To say otherwise is hypocrisy and ignorance. Internet app providers are just peers and equals to telcos, at an application level. To "win back" revenues, telcos need to compete with them, not just mildly refresh ancient services or transfer them to virtualised infrastructure. Design-led vs. Engineering-led service creation in telecoms - where does SDN/NFV fit? I've recently been spending a fair amount of time covering service-provider network virtualisation in terms of general NFV/SDN direction, and how that might impact the shape of future services, as well as the infrastructure itself. Some of that relates to evolution of routers and switches with SDN, virtualised network cores and aspects of the access/radio network like Cloud RAN. Here, thinking is being led by the "usual" major vendors like Cisco, Ericsson & Huawei, as well as plethora of startups. Also, quite a lot my Future of Voice and WebRTC research has pointed towards virtualisation of application-layer elements like media-processing, SBCs, IMS elements and so forth. Dialogic, Metaswitch, Oracle, HP, Broadsoft and others regularly crop up here, often pointing to the blurred boundaries of telcos' future NFV service infrastructure with that of third-party "cloud communications" platforms. One recent discussion with Cisco execs triggered a chain of thoughts about whether SDN/NFV actually helps operators with new service creation and deployment. The example given as a demo during a recent analyst event was the ability for a telco to add a new VPN service to its small-business networking portfolio. This was achieved by reprogramming the network nodes without human intervention or extra boxes, and automatically adding the new offering to the catalogue. In theory, it should make it easy for SME customers to just add the remotely-created and -provisioned VPN service to their existing broadband, or obtain it as part of a bundle along with other cloud application propositions, like Office 365 or Salesforce. The assertion was that this enabled "easy service creation" and this model could be extended to all areas of telecoms applications and capabilities, adding extra network APIs such as QoS/SLAs as well. This fits with a model I've been talking through in many of my recent client engagements and public presentations - the difference between a services curator and a services designer. A curator takes pre-existing services (from internal groups, vendors or partners) and packages/distributes/delivers them to end-users. A designer actually conceives completely new ideas and then has to work out how to create and develop them. In the scenario above, a VPN is not really a new service idea - it's a fairly standard and well-understood product, although obviously pricing, control features and configuration may have some "special sauce" involved. An operator might also want to reconfigure its SDN-powered network to implement services like cloud-based "virtual set-top boxes", or distributed CDNs, across the different nodes. They may have various clever mechanisms for load-balancing, resource management, geographic dispersal and so forth. But again, those are "engineering-led services", solving operational business problems, rather than human ones. Moreover, a curator-type telco is primarily looking to sell "on net" services to existing access customers, either on fixed or mobile networks. Often, the original designer or vendor behind a given service will have plenty of other distribution channels elsewhere - a telco is probably not going to sell many VPN instances outside of its access-customer footprint. As such, it may well become possible to integrate curated apps and services with extra in-network capabilities such as QoS, analytics, enhanced security and so on. 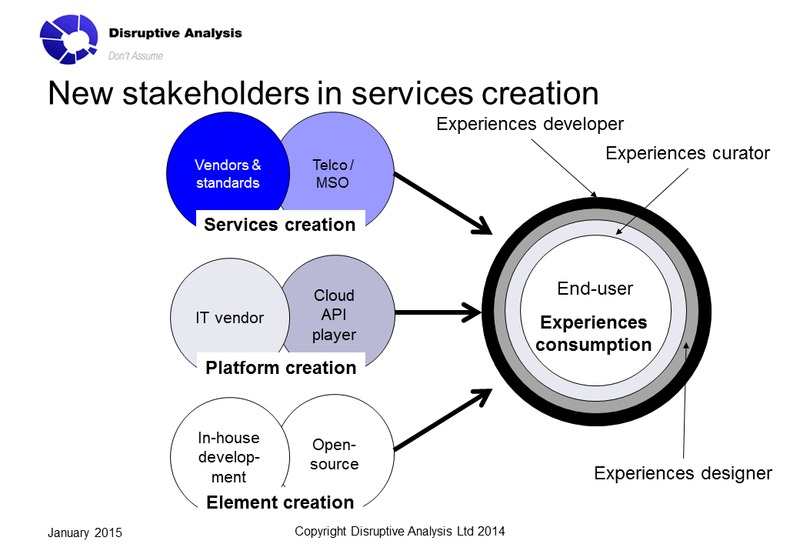 Conversely, the designer-type telco services team is probably more distant from the access network. They may have invented a concept for a new type of conferencing, or perhaps collaborated on a new reality-TV interaction model, or worked with government on a telemedicine solution. These type of innovations will likely be delivered outside the operator's footprint, to the web at large, or via mobile apps connected on 3rd-party cellular or WiFi networks. It will be a priority to gain access to as large a potential user-base as possible, and that will implicitly mean that unmanaged, variable-quality network will be encountered. (This fits with the earlier term "Telco-OTT", which I have now abandoned). Design-led service creation might also be based on a network platform where one end is on-net but parts of the interaction are off-net. For example, I recently challenged the world (via Twitter) to find a way for me to charge people using "withheld numbers" for calling me anonymously. In response, my friends at voice-oriented development consultancy Voxygen quickly created a new "telecom app" for me on their cloud-based virtual platform integrated with carriers' voice systems. This allows easy "mini-app" creation, either purely in-network or with a well-designed mobile app as a front-end. It's not full-blown NFV, but is an example of having "a design idea" (ie coming from the perspective of a real human problem) and then finding the best/fastest way to make it real, via a cloud infrastructure. What is currently unclear is whether telcos might benefit more from "engineered services" or "designed services" - or indeed various hybrids. Which domain has more revenue potential, for the lowest extra cost/risk? A lot of this comes back to the oft-debated question of "does the network really matter, or is it a commodity?" I don't think anyone has done a comparative study of these two worldviews yet. Yet it is perhaps the single most pivotal question about the telecom industry filling the "revenue gap" that faces it - and by extension, how much emphasis and investment should be focused on network-centric platforms vs. application-centric ones, and also what the relative value of SDN and NFV are, in terms of revenue-generating opportunity. The rumoured Google MVNO: what's likely & unlikely? For the last couple of weeks, speculation has been rife that Google is working on an MVNO-type service offering, probably based on both T-Mobile US and Sprint's networks, plus also incorporating a significant WiFi component. Apparently, it is called "Project Nova" at the moment. But beyond that, details are scarce. It's not obvious exactly whom the service will be aimed at, or whether it's a big near-term strategic play, or more of a tactic to gain insight into service-provision practicalities with a view to a much longer-term project. Perhaps it's even thinking about owning more spectrum directly at some point, or influencing the direction of 5G "from the inside of the tent"? Indeed, Google is not the first major Internet player to dip its toe into the mobile resale/connectivity market. Disruptive Analysis has already done a lot of work analysing the strategic relevance - and perhaps irrelevance - of Apple's SIM offering announced last October. (See the original blog post here and for a more detailed analysis it's included in the new update of the mobile broadband monetisation study, see here). Facebook's Whatsapp arm has an MVNO deal in Germany too. (And in fact, Google itself was rumoured to have a Spanish MVNO a few years ago). In fact, it was the eye-watering overhype about "Apple becoming an MVNO, dis-intermediating the telcos" with its SIM card, that has prompted me to think a bit more carefully about Google, and what is most likely to be going on here. Will Google be issuing its own SIM cards? Is this a US-only concept, or are other options possible, for example through T-Mobile's European OpCo's, or even Sprint's owner Softbank in Japan? Most Google services are internationally-applicable, although its Fiber infrastructure arm is US-only. Will the service include classical "telephony" at all, or is it a data-only pitch? Will it be integrated with Google Voice in any way? The one which everyone seems to be thinking about is a WiFi-first proposition, like Republic Wireless or Cablevision Freewheel. These would use cellular connectivity as a backup to "offload from WiFi" rather than vice versa. This is possible, but I can't help but think it's difficult to differentiate for Google - its own WiFi footprint isn't that large, so it would have to integrate with the same "curated" hotspot aggregators/wholesalers as various others. Aside from offering its own devices, this just doesn't seem "special" enough to go through all the cost and hassle. One possibility for Google could be a unique form of pricing rather than standard "monthly plans" - perhaps part-subsidised by itself or others, perhaps customised on a per-user basis. (My idea from a couple of years ago was insurance-style pricing for mobile data). A "freemium" model could also work. This could be adjusted based on the balance of WiFi vs. cellular access, whether the user tended to consume advertising-rich apps, and so on. All that said, unless this is just another Google small-scale experiment, it would be extremely tough for it to scale to millions or tens of millions of users, without huge investments in sales and support infrastructure. Instead, perhaps a likelier option is that this is - like Apple's SIM - a tablet-oriented service rather than a smartphone-based one. This gets around two problems - firstly, it doesn't need a conventional numbered "phone service", and secondly it can be pitched to the operator partners as a way of adding extra cellular devices to the market, rather than competing for market share of existing ones. Data-only connections also don't come with lots of the traditional perceptual baggage of being a "monthly plan". Perhaps integrated both with Google's own Nexus tablets and also other OEMs' if they wanted it, this could allow various models for data access - subscription, PAYG prepay, sponsored, WiFi-primary, daily rates and so on. It would be a win-win-win if Google could increase "cellular attach rate" in tablets, increase hardware margins by selling more expensive 4G-enabled ones, and improve user utility when out-and-about, and, obviously, collect more user-data on behaviour. It might also be possible to make it all "black-boxed" enough to avoid the need for complex and expensive (voice-based) customer service, billing queries etc. It's not obvious if Google is aiming at a US national roll-out, or perhaps initially just confined to areas where it has fibre assets. Some sort of quad-play offer could make sense, combining fixed-broadband access with TV, phone and perhaps tablet propositions. One slightly cynical view is that this is a great way for Google to better understand, model and learn from mobile user behaviour at first-hand, before perhaps getting more involved in the network-building business in the (much) longer term - 5G and beyond, perhaps. This could give it deep insights into real-world patterns of mobile usage, without seeing them through the filter of third-party data services. Potentially, this could be a "real world" R&D play, that could feed back into product design, bundling, and new application opportunities in its core business. It's also notable that Apple is now part of NGMN, Facebook is involved with GSMA - so getting "closer to the network" makes sense for Google as well. One other option is that the "traditional" smartphone/tablet dataplan concept is completely off-beam here. This could all also be a prelude to a verticalised M2M play. For example, Google might be launching an integrated in-car mobile platform with pre-embedded SIMs and bundled connectivity, either to be sold to car manufacturers, or as an aftermarket option for drivers. That would also fit nicely with its future aspirations for driver-less cars and the Google Express delivery service. Taking that theme further, it could be aimed at IoT rather than smartphone/tablet use-cases. Maybe a less-awkward version of Glass or other wearables, again with pre-provisioned connectivity. Ordinary, mainstream, standalone, "phone-centric" cellular plans competing with both the host operators and AT&T and Verizon. Too competitive, too scale-driven, too likely to annoy existing partners - and too low-margin to be of interest to Google's shareholders. Realtime dynamic switching between mobile operators based on coverage, capacity etc. I can imagine an Apple-style provisioning process, or something with a multi-IMSI SIM card, but I'm deeply unconvinced that it'll hop from T-Mo to Sprint and back in realtime. If it's a data-only service (eg for tablets), it might not bother with 2G/3G connections on GSM or CDMA. Unlikely to be a SIM-only service, like many MVNOs outside the US. The idea of putting a cheap Google SIM in an unlocked iPhone doesn't seem something that any of the companies involved would want. Sadly, I suspect that Google isn't likely to anything truly innovative with voice or video, like contextual communications, intention-based communications, hypervoice/hypersense - or especially, anything to do with privacy-invading "deep conversation inspection". There might be some WebRTC extensions for Hangouts though - especially if Chrome takes a larger role in future devices' UI. It's definitely not going to have anything to do with balloons, satellites or drones, at least for the next few years. Anything that causes difficulties in terms of Net Neutrality is likely to be avoided. Forget about Fast Lanes, differentiated/charged QoS - and I don't think it's in Google's interest to play games with zero-rating on its own MVNO either. Although it could go the opposite route with "loyalty" points, eg "Use X, Y, Z services and get an extra 1GB of data", without hypothecating it for use with just a specific app. Unlikely that Google will have any form of deep network integration / policy-control - especially if it needs to work with two separate hosting networks with different infrastructure and platforms. It's unlikely to be some sort of fixed-broadband service using mobile. Although the idea of using LTE to connect really distributed mini-servers/data-centres is an appealing, if slightly sci-fi, concept. It could be a huge network of mobile-backhauled WiFi hotspots, if I'm pushing that angle further. Overall, just as with Apple, I don't think this is going to be a Big Bang by Google in mobile. It will likely have one or two tactical near-term wins, but will be part of a cautious, long-term experiment and fishing-trip. While Google might have a "big strategy" in mind, with an eventual vision towards 5G, WiFi / satellite / drone overlays an so on, it cannot be certain of any given scenario at the moment. It also seems highly unlikely that Google just wants to be "another carrier" - although it might try to exert some pricing leverage. I'd say there's also a 70%+ chance that this will be mostly/totally aimed away from conventional smartphones and plans. I get annoyed by “unintended consequences”. Too often, they are only “unintended” because they were not predicted. Similarly, many forecasts fail to become real, as they overlook predictable problems – or perhaps, distant external factors that cut the ground from under them. Another category of “predictable failure” comes from wishful-thinking “visions” that ignore other, unstoppable trends that make them impossible. When it comes to analysing the future direction of technology markets – be it my normal stamping ground of telecoms, my broader futurism work, or even politics – I am constantly aware that companies, industry-bodies and self-appointed visionaries fail to look outside their narrow silos. Consistently, and near-universally. Now, obviously, nobody has a perfect crystal ball about what will happen. But it is often possible to determine what won’t happen, or at least has a vanishingly-small probability. And it is also possible to identify other factors which will almost-certainly happen in the same time frame – and see their possible inter-dependence. That’s all quite abstract, so a current real-world example: the use of online encryption, and the recent reaction from telcos and governments. It’s been pretty clear to me for years that once Moore’s Law meant that data could routinely be encrypted with minimal cost (monetary, power, latency, inconvenience etc), then it would be. It was locked-in. Pretty much inevitable. All other things being equal, people like increased privacy and security – or at least, the perception of it. And even if “people” didn’t want it, then it seemed likely that a lot of companies would, on their behalf. Encryption – like any security measure - can always be foregone, in specific circumstances, where it makes sense and all actors make rational decisions. It’s safer to make non-encryption the exception, not vice-versa. The exact timelines, technologies and architectures were less-clear (to me at least). And it certainly wasn’t obvious that the largest catalyst would be fears raised by a whistle-blower about state surveillance – although the growing use of VPNs, Tor and other techniques in repressive regimes were pointing that direction anyway. Continued examples of hacking of apps and servers, data leaks, credit card databases stolen and so forth also made “more encryption” a safe bet as a generic forecast. Invasive actions by telcos inspecting or modifying data traffic have also been a contributor – albeit perhaps less than I expected in pre-Snowden days. Now given that “more encryption” was what I’d call an “inevitability”, you might have thought that companies impacted by it might have started preparing long ago. Instead, the last 12 months have seen Governments and telcos panicked by the rise of HTTPS and SPDY, as well as proprietary encryption techniques used in apps, peer-to-peer technologies and VPNs. (I suspect that many security services had been quietly predicting this, but politicians seem to be treating it as a sudden surprise too). Now I’m not going to make a call on how to “deal with” encryption or not here, whether it’s a good or bad thing in certain circumstances – I just want to point out that the situation has been predictable. Yet nobody seems to have run a filter of “hmm, what happens when it all goes dark?” over their existing products, services and practices, over the last five years or so. The same concept of “inevitability” has also been the curse of many other technology domains. It has been inevitable since at least 2005 that, sooner or later, somebody would realise that sending 160 characters of text was pretty simple and cheap, and not worth 1-10c per message. Yet we had to go through years of vendors saying “mobile data can be worth $10000/MB, look at SMS!” without many people considering the inevitable conclusion that it wasn’t really “worth” that, when decent competition finally emerged. Instead, industry groupthink tried to pitch “value-based pricing”, when in reality it was “grudging-acceptance pricing”. The fact that the mobile industry has probably pocketed an extra trillion dollars in profits from over-priced SMS over the last decade is a fortunate accident. The emergence of Whatsapp, LINE & WeChat was a predictable – nay, inevitable – eventuality. In many ways, it was overdue. It was only some fairly clunky UIs and low penetration which stopped it happening during the Symbian/J2ME era, as there were plenty of early pre-Whatsapp attempts. The signs were there. Yet once again, that inevitability was ignored. Rather than making sensible attempts to defend SMS by adding value, the golden goose was ignored. Rather than reinvesting 5%, 10%, 20% in service innovation, SMS revenues were classified as “data” in operators’ financial reports and used to help justify 3G/4G licences and investments. This despite the inevitability that faster networks would make the risks even greater. Telephony is next up. We already know the inevitabilities there – and although some vendors and software developers are (finally) trying to make phone calls more useful and “friendly”, that message hasn’t percolated through to many in charge of investment and service-innovation at network operators. Instead, they are focused on recreating Telephony 1.0 and putting the bulk of investment into things like VoLTE. But telephony – and messaging – also have to counter effects other than just the “inevitability” of free/low-cost VoIP and IM. They also have to factor in the power of adjacency – things going on in the “silo next door” – or perhaps the silo down the street or over the horizon. For telephony, adjacencies come from various use-cases for WebRTC-type contextual communications, as well as concepts like hypervoice. But they also come from changes in human communication more broadly – the replacement of some “voice” tasks with apps (eg booking taxis), or perhaps richer forms of interaction like augmented/virtual reality. In the networking and broadband space, some adjacencies are starting to become visible – such as competition from new platforms such as satellites, drones and balloons, as well as direct peer-to-peer communications between devices. Others are less-obvious, such as the slow move of governments and large non-telecom companies into the domain of network ownership, as well as cloud services. Only today, bank Santander announced that it would offer online storage to businesses. Expect automotive, utility, healthcare and other providers to take prominent roles in IoT development – potentially including network ownership. As another example, there’s a lot going on in the arcane world of SIM cards. Everyone remembers a couple of weeks of excitement around the Apple SIM last year. But that’s just the tip of the iceberg. Have you heard about the liberalisation of MNC codes, and what that might imply in future, for example? What about downloadable IMSIs? Blinded by the acronyms and obscurity? Well, that’s where some of the disruptions are potentially coming from. Fore-warned is fore-armed. The trick here is to think not just in terms of projections and forecasts – but in terms of intersections. What other lines are coming up to meet your beautiful curves stretching out to the future? What happens to your assumptions when those lines cross? This gets much harder when one tries to apply the same principles to more general forecasting, or futurology. It’s easy to get caught out by automobiles when you try to predict the evolution of the horse-and-cart. The “paperless office” failed to take account of cheap printers, better online document-publishing – and human psychology and behaviour. Many, many predictors of “convergence” have completely missed other trends which actually favour “divergence” and fragmentation. There’s a lot of predictions about AI around at the moment – both utopian and (especially) dystopian. But few factor in other parallel trends, such as enhancement of human cognition, whether by software, pharmaceutical means, or even genetics. A whole host of societal trends also take on a new complexion, if one factors in increasing longevity, biomedical advances, robotics, nanotech, 3D printing and so on. What happens to our security (and encryption) when the smart lightbulb reads your email on your screen over your shoulder, or listens to your conversation, before you even get to tunnel it through a VPN? The story here is to look beyond the upbeat, positive predictions and hockey-stick curves. They’re seductive – but you also need to have a Devil’s advocate view, trying to pick holes in the narrative. Ideally, the ideas are not just “robust” to criticism, but as per Nassim Taleb, they are “antifragile” and strengthened by the challenge. I haven’t mentioned politics much in this post, but that’s an important domain for this type of analysis too. Many of the more populist agendas fall prey to the “unintended consequences” flaw. For example, imagine an anti-capitalist agenda that inadvertently breaks Moore’s Law, or the investment case for new factories to make chips, smartphones or PCs. Or perhaps, penalises entrepreneurs who make huge exits when they sell startups. At one level, it might be seen as preventing “planned obsolescence”, or reducing inequality. But if a knock-on effect is a slowing in technology needed for climate models, environmental sensor networks, design and development of new clean energy technologies – then it will have been a Pyrrhic victory, with severely negative consequences. Visionaries tend to think in terms of clean, idealistic utopias. Or of one over-arching metaphor like a “personal AI”, or a centrally-determined allocation & orchestration of processing or networking resources in a perfect cloud/NFV/SDN telecoms industry. They forget about legacy technologies, second-order effects, human behaviour, regulatory/political concerns and practical issues getting from “here and now” to the sunny uplands of the future. If the route goes via predictably-dangerous territory in between, the idealists have a duty to scrutinise it in advance. So in reality, the future is messy. And analysis of inevitabilities, and the practice of “anti-forecasting” (what won’t happen) need to form a part of any visionary’s or forecaster’s arsenal of weapons. The quote that the future is “already here, but unevenly distributed” comes from William Gibson, whose awkward, heterogeneous, sometimes-jarring worlds of the near-future are much more realistic than the beneficent, techno-utopian, AI-assisted Culture envisioned by my other favourite author, the late Iain M. Banks. Beware of “elegance” in technology (or socio-political) predictions – it’s almost inevitably wrong. Wishful-thinking is a useful thought experiment. But it’s not a “vision” – it’s just a screenplay or fictional plot, and usually a rigid one at that. Hybrids, overlaps, complexity, gaps, inefficiencies, blurred definitions, political and human realities, flexibility - those are the signs of a realistic forecast or prediction. If you are interested in due diligence, Devil’s Advocacy, or an open workshop/brainstorm on possibilities, inevitabilities or anti-forecasting, please get in touch, at information AT disruptive-analysis DOT com.